Advanced Analytic Methods in Science and Engineering is a comprehensive treatment of the advanced methods of applied mathematics. It was designed to strengthen the mathematical abilities of graduate students and train them to think on their own. This graduate-level course focuses on current research topics in computational complexity theory. Topics include: Nondeterministic, alternating, probabilistic, and parallel computation models; Boolean circuits; Complexity classes and complete sets; The polynomial-time hierarchy; Interactive proof systems; Relativization; Definitions of randomness; Pseudo-randomness and derandomizations;Interactive proof systems and probabilistically checkable proofs. Ce cours introduit le concept de ProbabilitÃ©, dont la puissance permet de modÃ©liser d'innombrables situations oÃ¹ le hasard intervient. Il est fondÃ© sur le livre de Sylvie MÃ©lÃ©ard "AlÃ©atoire : introduction Ã la thÃ©orie et au calcul des probabilitÃ©s" qui rÃ©sulte lui-mÃªme du cours de tronc commun de premiÃ¨re annÃ©e de l'Ã‰cole polytechnique. Use the power of algebra to understand and interpret points and lines (something we typically do in geometry). This will include slope and the equation of a line. Descartes and Cartesian Coordinates. The Coordinate Plane. Plot ordered pairs. Graphing points exercise. Graphing points. Quadrants of Coordinate Plane. Graphing points and naming quadrants exercise. Graphing points and naming quadrants. Points on the coordinate plane. Points on the coordinate plane. Coordinate plane word problems exercise. Coordinate plane word problems. Reflecting points exercise. Reflecting points. Ordered pair solutions of equations. Ordered Pair Solutions of Equations 2. Determining a linear equation by trying out values from a table. Equations from tables. Plotting (x,y) relationships. Graphs of Linear Equations. Application problem with graph. Ordered pair solutions to linear equations. Interpreting Linear Graphs. Exploring linear relationships. Recognizing Linear Functions. Interpreting linear relationships. Graphing lines 1. Recognizing Linear Functions. Linear and nonlinear functions (example 1). Linear and nonlinear functions (example 2). Linear and nonlinear functions (example 3). Linear and nonlinear functions. Graphing using X and Y intercepts. Graphing Using Intercepts. X and Y intercepts. X and Y intercepts 2. Solving for the x-intercept. Finding x intercept of a line. Finding intercepts for a linear function from a table. Linear function intercepts. Interpreting intercepts of linear functions. Interpreting and finding intercepts of linear functions. Analyzing and identifying proportional relationships ex1. Analyzing and identifying proportional relationships ex2. Analyzing and identifying proportional relationships ex3. Analyzing and identifying proportional relationships. Comparing proportional relationships. Constructing an equation for a proportional relationship. Constructing and comparing proportional relationships. Graphing proportional relationships example. Graphing proportional relationships example 2. Graphing proportional relationships example 3. Graphing proportional relationships. Comparing rates. Representing and comparing rates. Rates and proportional relationships. Rate problem with fractions 1. Unit cost with fractions 1. Rate problems 1. Slope of a line. Slope of a Line 2. Slope and Rate of Change. Graphical Slope of a Line. Slope of a Line 3. Slope Example. Hairier Slope of Line. Identifying slope of a line. Slope and Y-intercept Intuition. Line graph intuition. Algebra: Slope. Algebra: Slope 2. Algebra: Slope 3. Graphing a line in slope intercept form. Converting to slope-intercept form. Graphing linear equations. Fitting a Line to Data. Comparing linear functions 1. Comparing linear functions 2. Comparing linear functions 3. Comparing linear functions. Interpreting features of linear functions example. Interpreting features of linear functions example 2. Interpreting features of linear functions. Comparing linear functions applications 1. Comparing linear functions applications 2. Comparing linear functions applications 3. Comparing linear functions applications. Constructing a linear function word problem. Constructing and interpreting a linear function. Constructing linear graphs. Constructing and interpreting linear functions. Multiple examples of constructing linear equations in slope-intercept form. Constructing equations in slope-intercept form from graphs. Constructing linear equations to solve word problems. Linear equation from slope and a point. Finding a linear equation given a point and slope. Equation of a line from fractional slope and point. Constructing the equation of a line given two points. Finding y intercept given slope and point. Solving for the y-intercept. Slope intercept form from table. Slope intercept form. Idea behind point slope form. Linear Equations in Point Slope Form. Point slope form. Linear Equations in Standard Form. Point-slope and standard form. Converting between slope-intercept and standard form. Converting from point slope to slope intercept form. Converting between point-slope and slope-intercept. Finding the equation of a line. Midpoint formula. Midpoint formula. The Pythagorean theorem intro. Pythagorean theorem. Distance Formula. Distance formula. Perpendicular Line Slope. Equations of Parallel and Perpendicular Lines. Parallel Line Equation. Parallel Lines. Parallel Lines 2. Parallel lines 3. Perpendicular Lines. Perpendicular lines 2. Equations of parallel and perpendicular lines. Distance between a point and a line. Distance between point and line. Algebra: Slope and Y-intercept intuition. Algebra: Equation of a line. CA Algebra I: Slope and Y-intercept. Graphing Inequalities. Solving and graphing linear inequalities in two variables 1. Graphing Linear Inequalities in Two Variables Example 2. Graphing Inequalities 2. Graphing linear inequalities in two variables 3. Graphs of inequalities. Graphing linear inequalities. Graphing Inequalities 1. Graphing and solving linear inequalities. CA Algebra I: Graphing Inequalities. Similar triangles to prove that the slope is constant for a line. Slope and triangle similarity 1. Slope and triangle similarity 2. Slope and triangle similarity 3. Slope and triangle similarity 4. Slope and triangle similarity. Average Rate of Change Example 1). Average Rate of Change Example 2). Average Rate of Change Example 3). Average rate of change when function defined by equation. Average rate of change. Descartes and Cartesian Coordinates. The Coordinate Plane. Plot ordered pairs. Graphing points exercise. Graphing points. Quadrants of Coordinate Plane. Graphing points and naming quadrants exercise. Graphing points and naming quadrants. Points on the coordinate plane. Points on the coordinate plane. Coordinate plane word problems exercise. Coordinate plane word problems. Reflecting points exercise. Reflecting points. Ordered pair solutions of equations. Ordered Pair Solutions of Equations 2. Determining a linear equation by trying out values from a table. Equations from tables. Plotting (x,y) relationships. Graphs of Linear Equations. Application problem with graph. Ordered pair solutions to linear equations. Interpreting Linear Graphs. Exploring linear relationships. 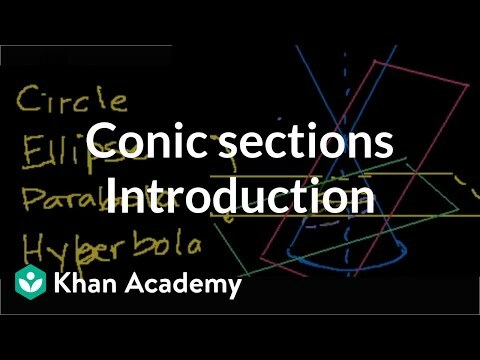 Recognizing Linear Functions. Interpreting linear relationships. Graphing lines 1. Recognizing Linear Functions. Linear and nonlinear functions (example 1). Linear and nonlinear functions (example 2). Linear and nonlinear functions (example 3). Linear and nonlinear functions. Graphing using X and Y intercepts. Graphing Using Intercepts. X and Y intercepts. X and Y intercepts 2. Solving for the x-intercept. Finding x intercept of a line. Finding intercepts for a linear function from a table. Linear function intercepts. Interpreting intercepts of linear functions. Interpreting and finding intercepts of linear functions. Analyzing and identifying proportional relationships ex1. Analyzing and identifying proportional relationships ex2. Analyzing and identifying proportional relationships ex3. Analyzing and identifying proportional relationships. Comparing proportional relationships. Constructing an equation for a proportional relationship. Constructing and comparing proportional relationships. Graphing proportional relationships example. Graphing proportional relationships example 2. Graphing proportional relationships example 3. Graphing proportional relationships. Comparing rates. Representing and comparing rates. Rates and proportional relationships. Rate problem with fractions 1. Unit cost with fractions 1. Rate problems 1. Slope of a line. Slope of a Line 2. Slope and Rate of Change. Graphical Slope of a Line. Slope of a Line 3. Slope Example. Hairier Slope of Line. Identifying slope of a line. Slope and Y-intercept Intuition. Line graph intuition. Algebra: Slope. Algebra: Slope 2. Algebra: Slope 3. Graphing a line in slope intercept form. Converting to slope-intercept form. Graphing linear equations. Fitting a Line to Data. Comparing linear functions 1. Comparing linear functions 2. Comparing linear functions 3. Comparing linear functions. Interpreting features of linear functions example. Interpreting features of linear functions example 2. Interpreting features of linear functions. Comparing linear functions applications 1. Comparing linear functions applications 2. Comparing linear functions applications 3. Comparing linear functions applications. Constructing a linear function word problem. Constructing and interpreting a linear function. Constructing linear graphs. Constructing and interpreting linear functions. Multiple examples of constructing linear equations in slope-intercept form. Constructing equations in slope-intercept form from graphs. Constructing linear equations to solve word problems. Linear equation from slope and a point. Finding a linear equation given a point and slope. Equation of a line from fractional slope and point. Constructing the equation of a line given two points. Finding y intercept given slope and point. Solving for the y-intercept. Slope intercept form from table. Slope intercept form. Idea behind point slope form. Linear Equations in Point Slope Form. Point slope form. Linear Equations in Standard Form. Point-slope and standard form. Converting between slope-intercept and standard form. Converting from point slope to slope intercept form. Converting between point-slope and slope-intercept. Finding the equation of a line. Midpoint formula. Midpoint formula. The Pythagorean theorem intro. Pythagorean theorem. Distance Formula. Distance formula. Perpendicular Line Slope. Equations of Parallel and Perpendicular Lines. Parallel Line Equation. Parallel Lines. Parallel Lines 2. Parallel lines 3. Perpendicular Lines. Perpendicular lines 2. Equations of parallel and perpendicular lines. Distance between a point and a line. Distance between point and line. Algebra: Slope and Y-intercept intuition. Algebra: Equation of a line. CA Algebra I: Slope and Y-intercept. Graphing Inequalities. Solving and graphing linear inequalities in two variables 1. Graphing Linear Inequalities in Two Variables Example 2. Graphing Inequalities 2. Graphing linear inequalities in two variables 3. Graphs of inequalities. Graphing linear inequalities. Graphing Inequalities 1. Graphing and solving linear inequalities. CA Algebra I: Graphing Inequalities. Similar triangles to prove that the slope is constant for a line. Slope and triangle similarity 1. Slope and triangle similarity 2. Slope and triangle similarity 3. Slope and triangle similarity 4. Slope and triangle similarity. Average Rate of Change Example 1). Average Rate of Change Example 2). Average Rate of Change Example 3). Average rate of change when function defined by equation. Average rate of change. Understanding and solving equations with imaginary numbers. 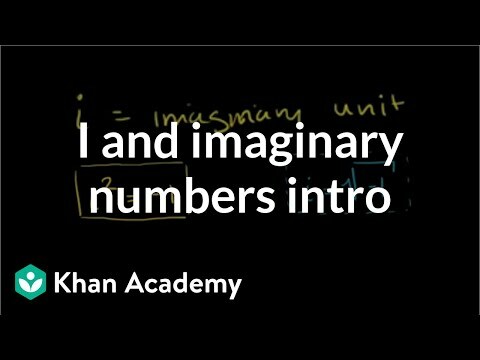 Introduction to i and Imaginary Numbers. Calculating i Raised to Arbitrary Exponents. Imaginary unit powers. Imaginary Roots of Negative Numbers. i as the Principal Root of -1 (a little technical). Complex numbers. Complex numbers (part 1). Complex numbers (part 2). Plotting complex numbers on the complex plane. The complex plane. Adding Complex Numbers. Subtracting Complex Numbers. Adding and subtracting complex numbers. Multiplying Complex Numbers. Multiplying complex numbers. Complex Conjugates Example. Dividing Complex Numbers. Dividing complex numbers. Absolute value of a complex number. Absolute value of complex numbers. Example: Complex roots for a quadratic. Algebra II: Imaginary and Complex Numbers. Introduction to i and Imaginary Numbers. Calculating i Raised to Arbitrary Exponents. Imaginary unit powers. Imaginary Roots of Negative Numbers. i as the Principal Root of -1 (a little technical). Complex numbers. Complex numbers (part 1). Complex numbers (part 2). Plotting complex numbers on the complex plane. The complex plane. Adding Complex Numbers. Subtracting Complex Numbers. Adding and subtracting complex numbers. Multiplying Complex Numbers. Multiplying complex numbers. Complex Conjugates Example. Dividing Complex Numbers. Dividing complex numbers. Absolute value of a complex number. Absolute value of complex numbers. Example: Complex roots for a quadratic. Algebra II: Imaginary and Complex Numbers. 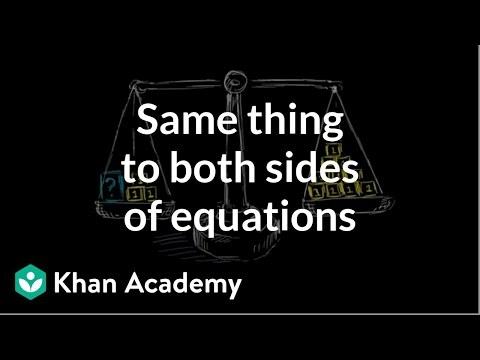 Videos exploring why algebra was developed and how it helps us explain our world. Origins of Algebra. Abstract-ness. The Beauty of Algebra. 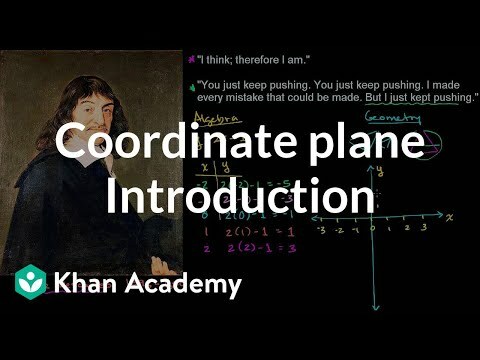 Descartes and Cartesian Coordinates. Why all the letters in Algebra?. What is a variable?. Why aren't we using the multiplication sign. Example: evaluating an expression. Example: evaluate a formula using substitution. Evaluating exponential expressions 2. Evaluating expressions in one variable. Expressions with two variables. Example: Evaluating expressions with 2 variables. Examples of evaluating variable expressions. Evaluating expressions in 2 variables. Example evaluating expressions in word problems. Evaluating expressions 3. Combining like terms. Adding like rational terms. Combining Like Terms 1. Combining Like Terms 2. Combining Like Terms 3. Combining like terms. Combining like terms and the distributive property. Combining like terms with distribution. Factoring a linear expression with rational terms. Distributive property with rational terms. Manipulating linear expressions with rational coefficients. Equivalent forms of expressions 1. Equivalent forms of expressions 1. Writing Expressions 1. Writing expressions. Writing Expressions 2. Writing expressions 2 exercise example. Writing expressions 2. Interpreting linear expressions example. Interpreting linear expressions example 2. Interpreting linear expressions. Writing expressions 3 exercise example 1. Writing expressions 3 exercise example 2. Writing expressions 3 exercise example 3. Writing expressions 3. Why we do the same thing to both sides: simple equations. Representing a relationship with a simple equation. One-Step Equation Intuition. One step equation intuition exercise intro. One step equation intuition. Adding and subtracting the same thing from both sides. Intuition why we divide both sides. Why we do the same thing to both sides: two-step equations. Why we do the same thing to both sides: multi-step equations. Why we do the same thing to both sides basic systems. Why all the letters in Algebra?. Super Yoga Plans- Basic Variables and Equations. Super Yoga Plans- Solving One-Step Equations. Constructing and solving equations in the real world 1. Super Yoga Plans- Plotting Points. Super Yoga Plans- Solving Systems by Substitution. Super Yoga Plans- Solving Systems by Elimination. Variables Expressions and Equations. Solving equations and inequalities through substitution example 1. Solving equations and inequalities through substitution example 2. Solving equations and inequalities through substitution example 3. Solving equations and inequalities through substitution example 4. Solving equations and inequalities through substitution. Dependent and independent variables exercise example 1. Dependent and independent variables exercise example 2. Dependent and independent variables exercise example 3. Dependent and independent variables. Origins of Algebra. Abstract-ness. The Beauty of Algebra. Descartes and Cartesian Coordinates. Why all the letters in Algebra?. What is a variable?. Why aren't we using the multiplication sign. Example: evaluating an expression. Example: evaluate a formula using substitution. Evaluating exponential expressions 2. Evaluating expressions in one variable. Expressions with two variables. 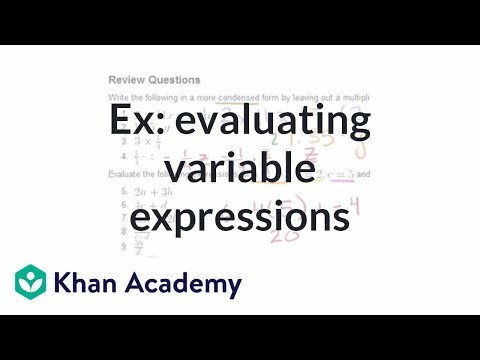 Example: Evaluating expressions with 2 variables. Examples of evaluating variable expressions. Evaluating expressions in 2 variables. Example evaluating expressions in word problems. Evaluating expressions 3. Combining like terms. Adding like rational terms. Combining Like Terms 1. Combining Like Terms 2. Combining Like Terms 3. Combining like terms. Combining like terms and the distributive property. Combining like terms with distribution. Factoring a linear expression with rational terms. Distributive property with rational terms. Manipulating linear expressions with rational coefficients. Equivalent forms of expressions 1. Equivalent forms of expressions 1. Writing Expressions 1. Writing expressions. Writing Expressions 2. Writing expressions 2 exercise example. Writing expressions 2. Interpreting linear expressions example. Interpreting linear expressions example 2. Interpreting linear expressions. Writing expressions 3 exercise example 1. Writing expressions 3 exercise example 2. Writing expressions 3 exercise example 3. Writing expressions 3. Why we do the same thing to both sides: simple equations. Representing a relationship with a simple equation. One-Step Equation Intuition. One step equation intuition exercise intro. One step equation intuition. Adding and subtracting the same thing from both sides. Intuition why we divide both sides. Why we do the same thing to both sides: two-step equations. Why we do the same thing to both sides: multi-step equations. Why we do the same thing to both sides basic systems. Why all the letters in Algebra?. Super Yoga Plans- Basic Variables and Equations. Super Yoga Plans- Solving One-Step Equations. Constructing and solving equations in the real world 1. Super Yoga Plans- Plotting Points. Super Yoga Plans- Solving Systems by Substitution. Super Yoga Plans- Solving Systems by Elimination. Variables Expressions and Equations. Solving equations and inequalities through substitution example 1. Solving equations and inequalities through substitution example 2. Solving equations and inequalities through substitution example 3. Solving equations and inequalities through substitution example 4. Solving equations and inequalities through substitution. Dependent and independent variables exercise example 1. Dependent and independent variables exercise example 2. Dependent and independent variables exercise example 3. Dependent and independent variables. Why we do the same thing to both sides: simple equations. Representing a relationship with a simple equation. One-Step Equation Intuition. One step equation intuition exercise intro. One step equation intuition. Adding and subtracting the same thing from both sides. Intuition why we divide both sides. Why we do the same thing to both sides: two-step equations. Why we do the same thing to both sides: multi-step equations. Why we do the same thing to both sides basic systems. Super Yoga Plans- Basic Variables and Equations. Super Yoga Plans- Solving One-Step Equations. Constructing and solving equations in the real world 1. Super Yoga Plans- Plotting Points. Super Yoga Plans- Solving Systems by Substitution. Super Yoga Plans- Solving Systems by Elimination. Constructing and solving equations in the real world 1 exercise. Simple Equations of the form Ax=B. Example solving x/3 =14. One-step equations with multiplication. Example solving x+5=54. Examples of one-step equations like Ax=B and x+A = B. One step equations. Solving Ax+B = C. Two-Step Equations. Example: Dimensions of a garden. Example: Two-step equation with x/4 term. 2-step equations. Basic linear equation word problem. Linear equation word problems. Linear equation word problem example. Linear equation word problems 2. Variables on both sides. Example 1: Variables on both sides. Example 2: Variables on both sides. Equation Special Cases. Equations with variables on both sides. Number of solutions to linear equations. Number of solutions to linear equations ex 2. Number of solutions to linear equations ex 3. Solutions to linear equations. Another Percent Word Problem. Percent word problems. Percent word problems 1 example 2). Solving Percent Problems 2. Solving Percent Problems 3. Percentage word problems 1. Percentage word problems 2. Rearrange formulas to isolate specific variables. Solving for a Variable. Solving for a Variable 2. Example: Solving for a variable. Solving equations in terms of a variable. Converting Repeating Decimals to Fractions 1. Converting 1-digit repeating decimals to fractions. Converting Repeating Decimals to Fractions 2. Converting multi-digit repeating decimals to fractions. Ex 1 Age word problem. Ex 2 Age word problem. Ex 3 Age word problem. Age word problems. Absolute Value Equations. Absolute Value Equations Example 1. Absolute Value Equation Example 2. Absolute Value Equations. Absolute Value Equations 1. Absolute value equation example. Absolute value equation with no solution. Absolute value equations. Absolute Value Inequalities. Absolute value inequalities Example 1. Absolute Inequalities 2. Absolute value inequalities example 3. Ex 2 Multi-step equation. Solving Equations with the Distributive Property. Solving equations with the distributive property 2. Ex 2: Distributive property to simplify . Ex 1: Distributive property to simplify . Ex 3: Distributive property to simplify . Multistep equations with distribution. Evaluating expressions where individual variable values are unknown. 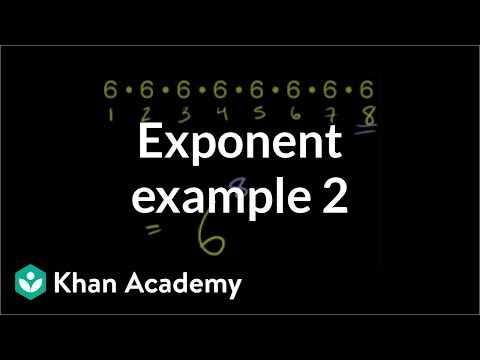 Evaluating expressions with unknown variables 2. Expressions with unknown variables. Expressions with unknown variables 2. Mixture problems 2. Basic Rate Problem. Early Train Word Problem. Patterns in Sequences 1. Patterns in Sequences 2. Equations of Sequence Patterns. Finding the 100th Term in a Sequence. Challenge example: Sum of integers. Integer sums. Integer sums. 2003 AIME II Problem 1. Bunch of examples. Mixture problems 3. Order of Operations examples. Algebra: Linear Equations 1. Algebra: Linear Equations 2. Algebra: Linear Equations 3. Algebra: Linear Equations 4. Averages. Taking percentages. Growing by a percentage. More percent problems. Age word problems 1. Age word problems 2. Age word problems 3. Why we do the same thing to both sides: simple equations. Representing a relationship with a simple equation. One-Step Equation Intuition. One step equation intuition exercise intro. One step equation intuition. Adding and subtracting the same thing from both sides. Intuition why we divide both sides. Why we do the same thing to both sides: two-step equations. Why we do the same thing to both sides: multi-step equations. Why we do the same thing to both sides basic systems. Super Yoga Plans- Basic Variables and Equations. Super Yoga Plans- Solving One-Step Equations. Constructing and solving equations in the real world 1. Super Yoga Plans- Plotting Points. Super Yoga Plans- Solving Systems by Substitution. Super Yoga Plans- Solving Systems by Elimination. Constructing and solving equations in the real world 1 exercise. Simple Equations of the form Ax=B. Example solving x/3 =14. One-step equations with multiplication. Example solving x+5=54. Examples of one-step equations like Ax=B and x+A = B. One step equations. Solving Ax+B = C. Two-Step Equations. Example: Dimensions of a garden. Example: Two-step equation with x/4 term. 2-step equations. Basic linear equation word problem. Linear equation word problems. Linear equation word problem example. Linear equation word problems 2. Variables on both sides. Example 1: Variables on both sides. Example 2: Variables on both sides. Equation Special Cases. Equations with variables on both sides. Number of solutions to linear equations. Number of solutions to linear equations ex 2. Number of solutions to linear equations ex 3. Solutions to linear equations. Another Percent Word Problem. Percent word problems. Percent word problems 1 example 2). Solving Percent Problems 2. Solving Percent Problems 3. Percentage word problems 1. Percentage word problems 2. Rearrange formulas to isolate specific variables. Solving for a Variable. Solving for a Variable 2. Example: Solving for a variable. Solving equations in terms of a variable. Converting Repeating Decimals to Fractions 1. Converting 1-digit repeating decimals to fractions. Converting Repeating Decimals to Fractions 2. Converting multi-digit repeating decimals to fractions. Ex 1 Age word problem. Ex 2 Age word problem. Ex 3 Age word problem. Age word problems. Absolute Value Equations. Absolute Value Equations Example 1. Absolute Value Equation Example 2. Absolute Value Equations. 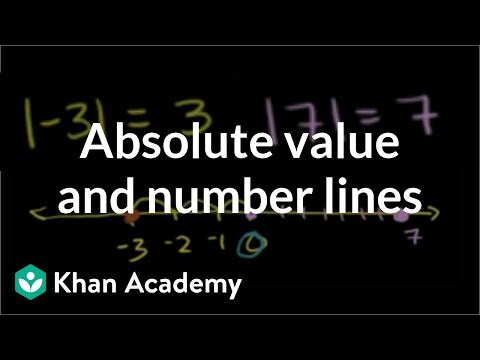 Absolute Value Equations 1. Absolute value equation example. Absolute value equation with no solution. Absolute value equations. Absolute Value Inequalities. Absolute value inequalities Example 1. Absolute Inequalities 2. Absolute value inequalities example 3. Ex 2 Multi-step equation. Solving Equations with the Distributive Property. Solving equations with the distributive property 2. Ex 2: Distributive property to simplify . Ex 1: Distributive property to simplify . Ex 3: Distributive property to simplify . Multistep equations with distribution. Evaluating expressions where individual variable values are unknown. Evaluating expressions with unknown variables 2. Expressions with unknown variables. Expressions with unknown variables 2. Mixture problems 2. Basic Rate Problem. Early Train Word Problem. Patterns in Sequences 1. Patterns in Sequences 2. Equations of Sequence Patterns. Finding the 100th Term in a Sequence. Challenge example: Sum of integers. Integer sums. Integer sums. 2003 AIME II Problem 1. Bunch of examples. Mixture problems 3. Order of Operations examples. Algebra: Linear Equations 1. Algebra: Linear Equations 2. Algebra: Linear Equations 3. Algebra: Linear Equations 4. Averages. Taking percentages. Growing by a percentage. More percent problems. Age word problems 1. Age word problems 2. Age word problems 3. Exploring a world where both sides aren't equal anymore!. Inequalities Using Multiplication and Division. One-step inequality with multiplication and division example. Constructing and solving one-step inequality. One step inequalities. One-Step inequality involving addition. Inequalities Using Addition and Subtraction. Two-step inequality example. Multi-Step Inequalities. Multi-Step Inequalities 2. Multi-Step Inequalities 3. Multi-step linear inequalities. 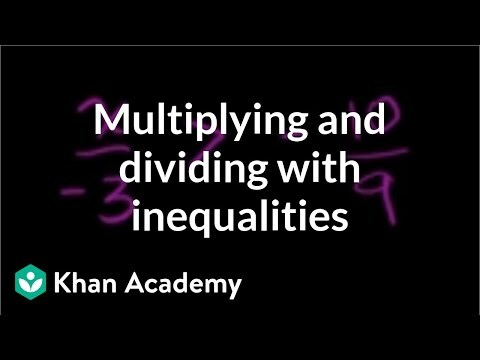 Interpreting Inequalities. Writing and using inequalities 2. Writing and using inequalities 3. Interpreting and solving linear inequalities. Inequality examples. Compound Inequalities. Compound Inequalities. Compound Inequalities 2. Compound Inequalities 3. Compound Inequalities 4. Compound inequalities. Absolute Value Inequalities. Absolute value inequalities Example 1. Absolute Value Inequalities Example 2. Absolute value inequalities example 3. Writing and using inequalities. Dogs cats and bears in a pet store visual argument. Dogs cats and bears in a pet store analytic argument. Reasoning through inequality expressions. Using expressions to understand relationships. Structure in expressions 1. Inequalities Using Multiplication and Division. One-step inequality with multiplication and division example. Constructing and solving one-step inequality. One step inequalities. One-Step inequality involving addition. Inequalities Using Addition and Subtraction. Two-step inequality example. Multi-Step Inequalities. Multi-Step Inequalities 2. Multi-Step Inequalities 3. Multi-step linear inequalities. Interpreting Inequalities. Writing and using inequalities 2. Writing and using inequalities 3. Interpreting and solving linear inequalities. Inequality examples. Compound Inequalities. Compound Inequalities. Compound Inequalities 2. Compound Inequalities 3. Compound Inequalities 4. Compound inequalities. Absolute Value Inequalities. Absolute value inequalities Example 1. Absolute Value Inequalities Example 2. Absolute value inequalities example 3. Writing and using inequalities. Dogs cats and bears in a pet store visual argument. Dogs cats and bears in a pet store analytic argument. Reasoning through inequality expressions. Using expressions to understand relationships. Structure in expressions 1.